Passionate about fitness? With a private gym featuring the latest equipment and with a studio offering fitness classes, The St. Regis Doha is the destination for the health conscious. Open 24 hours a day, the exercise room at The St. Regis Doha is a treat to the athletes' eye with an open, sunlit room to inspire for an exceptional work out. Find a selection of Cybex equipment such as elliptical machines, treadmills and Cyclone steppers to provide guests and members with all the right tools. Each machine has its own TV screens and cardiovascular monitors so you can enjoy your workout as well as track your activity levels. 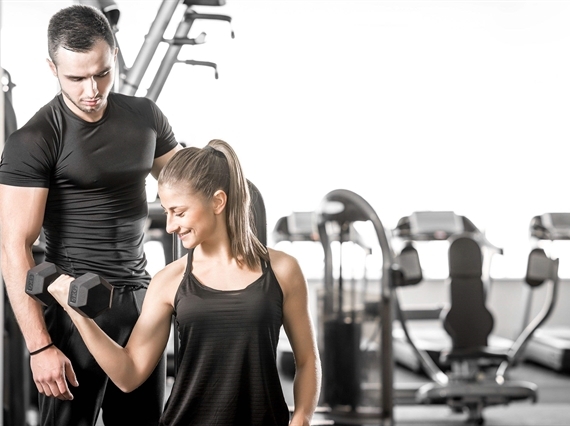 Friendly, expert personal trainers are standing by for guests who feel they would benefit from a little guidance. 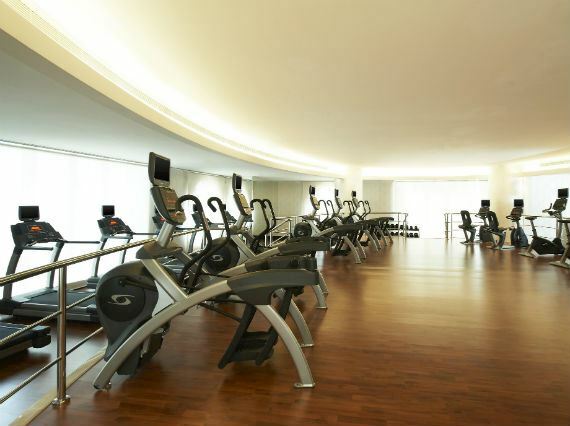 All the gym facilities at The St. Regis Doha are luxurious and modern designed and furnished with the most high performance fitness accessories, all to meet and exceed guest needs and expectations. This exclusive exercise experience can be toped of with a visit to our spacious and comfortable saunas, steam and shower rooms to refresh and re-energize. Service And Amenities 300 Sq./ 3200ft Fitness, Cardio, and stretch room, Male and female studios, Juice Bar, Personal trainers, Fitness Classes, Private Fitness Classes, Male and female sauna, Male and female steam rooms, Male and female experience shower rooms, Male and female changing rooms and lockers. Tennis lessons with our tennis instructor are available at the tennis courts out front of The St. Regis Doha. Depending on your preference the lessons can be specialised to work on for example your serve, backhand or forehand. A great opportunity to improve and enjoy the game. 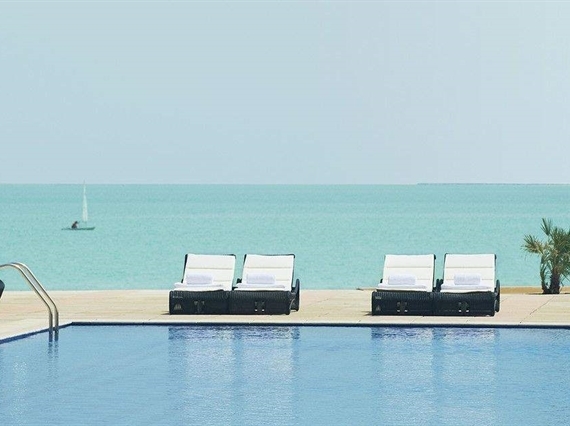 At The St. Regis Doha, guests and members are invited to use the Olympic-size pool and the glorious crystal clear waters of the Arabian Gulf in which they can take a dip. Relax and enjoy the day in one of the luxury floating beds, the gazebos by the pool or rent a private cabana for the day to enjoy a private sundeck and Jacuzzi. For the adventurers there are many activities to choose from - water sports, tennis, snorkeling, kayaking, beach soccer, beach volley, and much more. The St. Regis Doha has a hand-picked selection of experiences that will fit the whole family. A concierge or St. Regis Butler will be delighted to arrange this. Poolside dining is always a pleasure, especially for children who cannot bear to spend a moment away from the water, and the Oyster Bay & Bar offers delicious cuisine in a relaxed location with a Caribbean flavor. 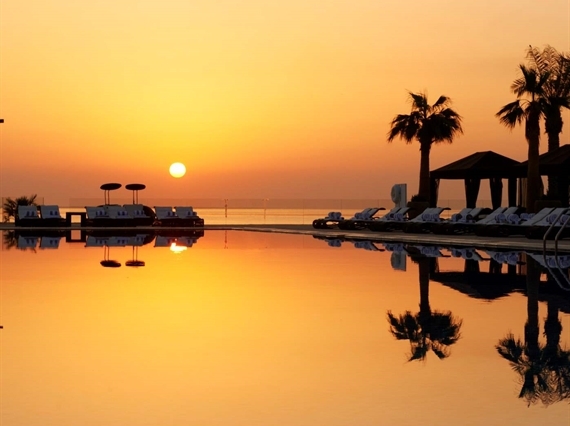 The pool and private beach are exclusively for the use of guests and lifestyle members and private cabanas may also be reserved at this most exquisite Doha Beach Resort. Enjoy The Sunny Days In Qatar With Us At The St. Regis Doha. With A Variation Of Exclusive, Fun Outdoor Activities To Fit The Whole Family, We Welcome You To The Finest Address. Snorkeling Gather A Group Of Friends Or Family To Explore The Sea. A Speed Boat Ride To Enjoy The Views Of Doha Such As The Museum Islamic Park, Dhows, To Then Snorkel At Sand Island. The Speed Boat Can Bring A Group Of Friends And Families Of 5 Guests At A Time To Enjoy The Wonders Of The Sea Together. If You Are Beginner, Sign Of For Our Snorkeling Lessons To Learn The Basics About Snorkeling And Get Guidance In Techniques By Our Experienced Instructors At The St. Regis Doha. This Is A Great Chance To Get Tips And To Prepare For Future Snorkeling Adventures. Speed Boat Water Sports Experience Our Speed Boat Water Activities, Water Skiing, Tube Riding, Knee Boarding And Wakeboarding. The St. Regis Speed Boat Can Accommodate 5 Guests At The Same Time And Our Experienced Recreation Staff Can Assist, Give Tips And Explain Techniques. 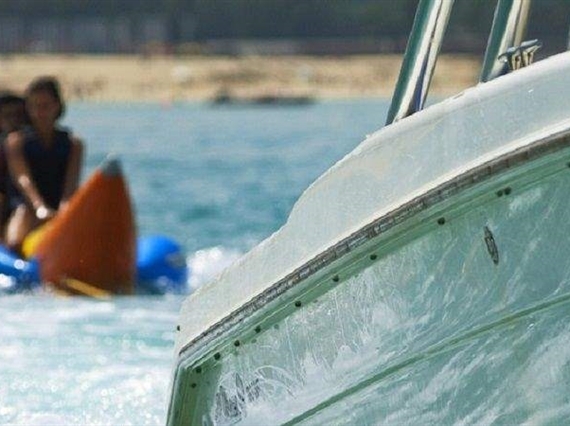 Thrilling Adventures And A Great Way To Share A Fun Afternoon Out On The Sea. Sunset Cruise Enjoy A Boat Ride Along The Shoreline Of Doha, Past The Museum Of Islamic Arts Park, Dhows, Arrive At Sand Island And Enjoy The Sunset On The Way Back To The Hotel. For Memorable Moments To Share With Friends And Family. Kayaking Enjoy Being On The Water And Beautiful Scenery. If You Are A Beginner, Meet With Experienced Lifestyle Instructor For A Kayak Lesson. Learn The Basics About Kayaking And Get Guidance In Techniques To Optimize Your Kayaking Experience. A Great Way To Develop Skills And To Increase The Enjoyment While In The Water. Pool Activities Enjoy A Swimming Lesson With A Professional Swimmer That Will Advise On Techniques And Set Up A Great Workout. Aqua Gym Or Water Stretching Are Other Group Classes That Are Available To Be Enjoyed By Both Adults And Children. Fun And Effective Exercises In The Water With Good Combination Of Exercises Focusing On Strength, Smoothness And Flexibility. Gather Your Friends And Family For A Polo Game In Our Olympic Size Pool. A Lifestyle Instructor Will Be Present To Organize, Assist And Explain The Game. Experience The Thrill Of The Sport And Have A Fun Hour In The Water. The St. Regis Doha has nine private cabanas near to our Olympic size pool. Bring your family to enjoy the day together. Relish in the private jacuzzi, and waiter service brought to you in your luxurious retreat. With a private sundeck, living room with flat screen TV, his and her bathrooms with vanity area, pool and beach access - the cabanas have much to offer, giving the guests an experience beyond expectation at the finest address. The St. Regis Doha offers a premier holistic training program, tailored to meet the specific needs of each individual. Discover the essence of a mind/body escape for a personalized and life changing fitness/wellness experience beyond expectation.